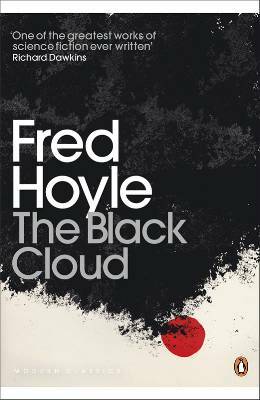 The front cover of my Modern Classics edition of Fred Hoyle’s The Black Cloud has a quote from Richard Dawkins: “One of the greatest works of science fiction ever written.” Well, it isn’t (though the combination of it first being published in 1957 and Richard Dawkins’ age would mean that it was probably a formative work for him). It is, however, an interesting work of science fiction and despite problems, I’m glad that I read it. “‘But it must have happened when the first member of your species arose,’ suggested McNeil. Incidentally, Simon Singh’s book Big Bang covers the development of the Big Bang theory well and is incredibly fair to Hoyle. Though (and as Dawkins says in the afterword), his later excursions in to biology are probably best left alone. The Black Cloud is a story about the detection of, and subsequent arrival in the solar system of, a – funnily enough – huge cloud (which, it transpires, is intelligent), . This has consequences for the Earth. Will it obscure the sun? Will it cool the planet down? Heat it up? What will happen to the diversity of life on Earth and will human civilisation survive? From this point of view, Hoyle has created a fun and fast moving novel (at just a little over 200 pages, there’s very little hanging around). More than this, though, it’s a novel about science, scientists, how science is done and the place of science in our culture (my understanding is that the more recent Life from Gwyneth Jones is similar in this respect – should really read it). These aspects, as well as providing an insight into the scientific world of the 1950s, still resonate today, I think. There is a conversation in the novel between civil servant Francis Parkinson (who was the point of communication between the government and the group of scientists who’d been installed in a country house to deal with the problem) and Kingsley, the abrasive and controversial scientist in charge of the team (familiar?). In this, Parkinson describes how he, as a relatively clever young man, gained an education in the classics at Oxford and, while not being quite bright enough to reach the highest echelons of government, found himself in the civil service. He feels himself to be ignorant of the what the scientists are discussing. This is reinforced at other points of the novel where Kingsley bemoans the ignorance of the politicians and their inability to properly deal with the kind of crisis they now were facing. These exchanges reminded me of C.P. Snow’s famous lecture “The Two Cultures” which decried the estrangement of the sciences and the humanities. Of course, while we weren’t visited by a huge super-intelligent space-cloud in the 1960s (when the novel was set), this idea resonates today. The growing questioning of ideas such as evolution (which as scientific theories go, hasn’t been eroded all that much in the years since Darwin proposed it), the baffling continued acceptance of nonsense, such as homoeopathy, by otherwise intelligent and rational people would suggest that society still is still split in this way. Hoyle’s novel also gives some interesting little insights into the way that the scientific community works (and worked). The way that things may be discovered through direct observation, or by indirect mathematical reasoning. Both these things happen in the novel: the cloud is detected by a telescope in California and in Cambridge the existence of the cloud is deduced mathematically. From a historical perspective the problems that the Western scientists have when dealing with their colleagues in the Soviet Union are of further interest. Hoyle gives a good impression of the way that the scientific community goes about its business and the constraints it finds imposed upon it. But the novel is more than this; as mentioned earlier, the story concerns the discovery of a cloud, which is obscuring the stars and moving towards the solar system. Initially the concern is what is to be done about an inanimate cloud which may, for a month or so, obscure the sun and lead to destruction on Earth. As the novel progresses, however, the scientists led by Kingsley, come to realise that the Cloud is intelligent and open communications with the entity. The cloud entity is a form of life far removed from that of the life on the Earth. When in conversation with the scientists, it expresses the view that life on earth is a fairly unlikely way of life arising and that it is more likely that intelligences would resemble itself. This is, I think, an interesting way of rejecting anthropocentric views of the universe: who is to say that intelligent life would necessarily resemble human beings? Though Hoyle does appear to reject an evolutionary explanation for the development of the Cloud, which is a little more troubling. The Black Cloud reminded me a lot of some of Arthur C. Clarke’s writing (though I maintain that Clarke is the better writer). It’s a lean novel, few words are wasted, but also there is little in the way of stylish writing. His dialogue, while not particularly bad, does tend towards scientists explaining events to each other and there are more than a few info-dumpy bits of writing (there is the odd joke, too, but it’s not a particularly witty novel). Often, this would annoy me, but the leanness of the novel, the admirably fast pace of the work and the interest that it held for me did make this a little more palatable and I’m glad that I read it. This entry was posted in Review and tagged fred hoyle, novel, sf. Bookmark the permalink.